Heat pumps are a great option to consider instead of a furnace or air conditioner. No matter the season or outside temperature, a heat pump works by moving heat to keep indoor environments comfortable. During winter, heat is collected from the outside and used to warm the air inside your home. Interestingly enough, even cold air contains heat. In the summer, a heat pump operates like a typical electric air conditioner. It collects heat from the air within a home and forces it outside. One of the benefits of heat pumps are their ability to provide years of worry-free heating and cooling and significant savings on energy bills. The amount a homeowner can save depends on several factors. For example, the efficiency of old equipment compared to that of a new heat pump will have an effect on how much money will be saved; also, the climate is another factor. While many people find the winter functionality of a heat pump difficult to understand since it seems counter-intuitive, it is during the heating cycle that the heat pump produces the most savings. Unlike a furnace that turns fossil fuel or electricity into heat, the heat pump collects heat that already exists in the outside air by way of its refrigeration cycle. 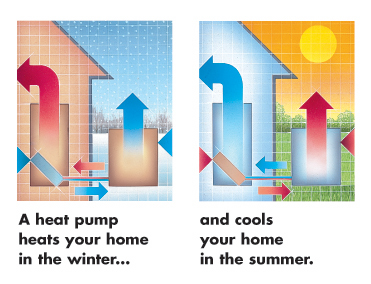 A heat pump will produce two to three times more heat than the energy it uses. If your old non-electric furnace is still working, an add-on heat pump is also an effective option. With a duel-fuel system, the two systems share the heating load. The heat pump will be the primary heating and cooling system. However, when the temperature drops below the heat pump’s set point, the furnace will take over until the temperature raises enough for the heat pump to operate more efficiently. If you’re considering a heat pump, an American Weathermakers technician can help you evaluate your options so you can get the most efficient model for your home. Give us a call at 847.509.7777.